The dire conditions because of a shortage of natural food in the bush have resulted in some irregular behaviour by very hungry animals. We had 2 break-ins at Katekani Luxury Tented Lodge by baboons – they messed things up comprehensively on both occasions. Margrett was inconsolable! We have now added wire reinforcing all around the Boma. At Marc’s the Nyala are so hungry that they feed ravenously on any fallen leaves or flowers right next to our enthralled guests. Nyala at Marc’s in poor condition. At Tremisana the warthog sounder spends most of the day inside the camp chomping away at the new grass sprouts. They are not scared of our guests and provide numerous photographic opportunities. No need for lawnmowers ! At Marula Boma the beefy aroma of the BBQ meats attracts hyena, jackal and genet. Once the guests board the open vehicles to return to Tremisana, they hungrily enter the Boma looking for scraps. As soon as the big rains fall, and I hope and pray this will happen in November, these unusual animal traits will be replaced by more normal behaviour. We encourage our guests and staff to use water sparingly. Water is a very scarce commodity. There have been associated issues and I am doing whatever I deem necessary to ensure that all our lodges receive whatever water is rightfully ours. On the game viewing front, it cannot get much better. Animals in Kruger are congregating around water points. Lions are a dead cert – we are getting really good close up shots. The Bush at the moment is in a dry state. We had some very light rain at Katekani and Marcs and parts of Kruger. Hopefully big rains will follow. The main water sources have been drying up slowly. Now mammals visit these few remaining water sources where predators lie and wait as they know the mammals will have to come there to quench their thirst. 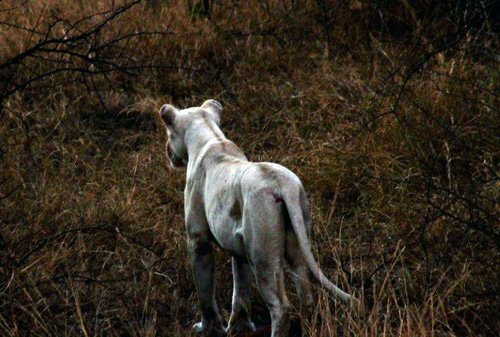 I had a great sighting of a white lion this month – not in great condition but OK. So this was actually a really Amazing day, as our timing was there at the right spots. Early entry at Orpen, finding two Elephant bulls. We then spotted a couple off buffalo dagga boys that were flat as the wind was cold. On the H7 we saw a lot of general game : Giraffes and Kudu bulls nibbling away on the new leaves. On the S36 we turned down to Rockvale waterhole where we spotted a pride of lions. Further on we saw plenty of zebra. Onwards to the famed S100 we viewed a breeding herd of elephants. Suddenly my colleague Charl just points at something and he tells me Leopard!! (To be honest I thought he was Joking), but when I looked there was a male Leopard walking – we saw him for 2 secs GONE!! but 60m further we tracked him again – what a sighting – everybody was sooo happy. We viewed him until he went into the bush. Further own the S100 we found a male Lion – also just enough time and he was gone. After Lunch we decide to head down south. At Nkaya Pan we found Wild Dogs sleeping flat in the grass – we counted 5 individuals. Towards Sweni S126 we were just in time to see some cheetahs but very far off. Actually Kruger on this day Loved us. 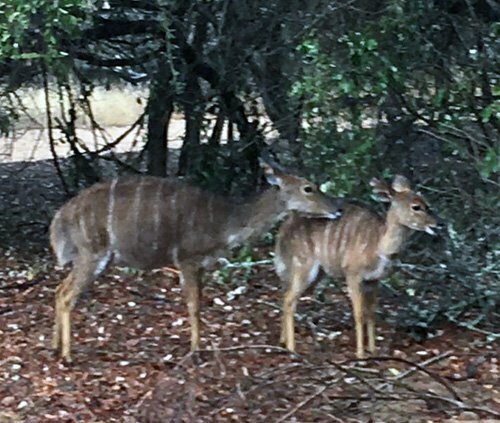 There are fewer than 200 of these mammals in the park ! Going on towards Orpen gate as it was already late afternoon we saw plenty of raptors including “Tawny Eagle”,”Brown Snake-Eagle”,”White Backed-Vulture with Baby”, Arriving at Orpen we were all dying for a coffee,and yes indeed what a sucessful day. Rhino were found as well —Location Not allowed to be shared but Beautiful males. The wind was freezing the entire day. Early morning Bull Elephant far off between boom gates. Plains Zebra,Greater Kudu,WaterBuck, Buffalo lying down on H7. On the S100 we saw a female Lioness just 5 kilometres down, She was about 25m off in tall grass as it was cold and windy, so she was lying down to keep the heat. Luckily she popped her head and half her body just enough for us to get some amazing Photos – Talk about Luck and Timing. Lunch!! After Lunch heading down South,we saw two Wild Dogs sleeping. On the S126 we saw Elephants and More Elephants everywhere ,wow. We took the S36 towards H7 and not even 2km in there was a Cheetah that had just caught an Impala – she was still panting and then suddenly she pulls this impala into the shade. We viewed her a good 20 min.We also did view Rhino but due to poaching we don‘t comunicate where. Hope everybody enjoyed reading – good luck with everything – and thank you for staying connected with the Bush Life. It has been an excellent month with spectacular sightings of big five and general game. I have not been on many morning drives but the few I had were a great way to start the day with giraffe, zebra, kudu and some mornings we were privileged to come across lion, elephant as well as black rhino. It is a short drive but all the while worth taking before saying goodbye to our guests for the journey back to Johannesburg. We offer this to guests who are too young or even too not so young to do the famous Bush Walk. A beautiful drive about 4 hours and great opportunity for game viewing. We have come across multiple elephant sightings as well as lion sightings. We have had encounters with black rhino and other general game. Conducted next to the Olifants river we get the opportunity to view the river residents : hippo and crocodile. We have encountered rhino as well as many herds of elephants and other general game. A 4 hour walk luckily not an army march but relaxed walk focusing on the smaller aspects that nature has to offer. We were very lucky the one morning to come across a leopard that had made a kill and were also able to view the impala up in a Marula tree next to the road. Short and enjoyable – a last drive on the Balule reserve for our Marc’s Treehouse and Tent guests to end a day with us at Tremisana. We have encountered lion, elephant as well as rhino on these drives accompanied by many general game sightings. A drive I truly enjoy. A picnic drive where we stop and see the sunset while having drinks and a few snacks. I adore this drive as I get to spend quality time with my guests and am able to enjoy a drive with them to show nature’s beauty as well as all the life she has to offer. 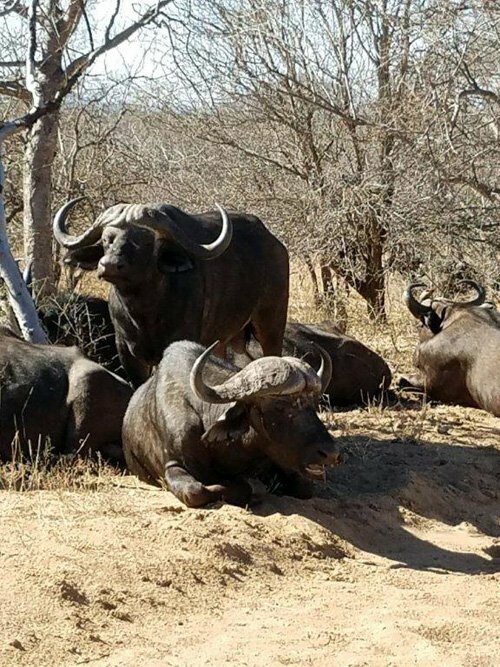 From rhino to elephant to lion to buffalo as well as general game this drive is a great experience for our guests that stay with us at Tremisana Game Lodge. An evening/ night drive offered to our guests upon arrival where we share their first experience in the Balule Nature Reserve – Greater Kruger area. We have had encounters with lion, elephant, buffalo right next to the dinner area at Marula Boma where we enjoy a traditional African meal under the stars and are able to see the nocturnal life such as hyena, honey badgers and porcupines roaming around us. We then make our way back to the lodge and enjoy the evening further preparing for the next adventure the next morning. I have been struggling a little more than last month to see animals regularly on Balule as they are moving everywhere searching for food. The bush once again surprised me on my sunset drive. I was driving down Marula road looking at the impalas and kudu then I saw giraffes concentrating their attention on one place. I explained to my guests that there’s a predator around. The guest didn’t want to believe me – they were too busy taking pictures and were very excited to see the giraffes. Then the giraffes started to run towards us. There was a big male leopard stalking them because there were some baby giraffes with them. My guests were very happy to see that. Lots and lots and lots more of pictures – then we left. Sometimes the bush will surprise you. My sundowner drive was quiet in the beginning I took Olifants road and we saw impalas and kudu on Barnards. Then I turned to Campfire – that’s where we saw one elephant next to Letitia house – that was great because he didn’t care about us he just continued eating. My guests were very excited to see that one. I drove down to sable road up until we reached Rome 1 on the river at a picnic spot – that’s where we had our drinks. While we were having our drinks five male elephants come down to the river from the other side – it was an amazing sundowner! Buffalo sighting near Marula Boma. I went on my bush walk with Rex using two vehicles because we had 14 guests that day. I explained to our guests the rules of the walk. As you know that I talk a lot then we went down to the river, we showed them hippos and surprisingly we managed to see crocodile despite it being cold in the morning. On our way back to the Cruisers, Rex saw some female rhinos and the baby on the southern side and he called us to see them while we were enjoying and telling them that black rhinos are dangerous. We then saw another vehicle from another lodge coming and they stopped making a huge noise. Next thing Zulu the wild and dangerous Black rhino bull wanted to connect the car with those people because they were talking so loudly. The angry rhinos were not happy with those people. Then they drove fast to get away from him. After they were gone we were in trouble because Zulu saw us then he came and had a good look at what was going on. Luckily he stopped. It took us a very long time to reach our vehicles because the female rhinos and the baby were close to the vehicles. Thank God I managed to get my guests to the vehicle and I believe they now have a history and story about the rhinos. 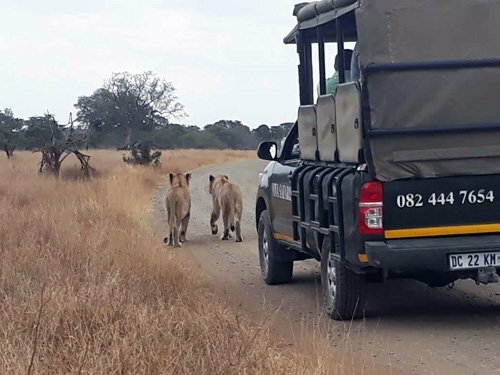 On the 03 on Sable road we found 2 male Lions and 1 female lying down and later 1 male walked away and the other started mating very close to the road. On the 06 at Tremisana Lodge there was a big herd of elephant bulls – some were drinking water and some were eating around the lodge. On the 16 at Rome1 we found the pride of Lions 3 males, 7 females and 12 cubs all walking past very close to us. 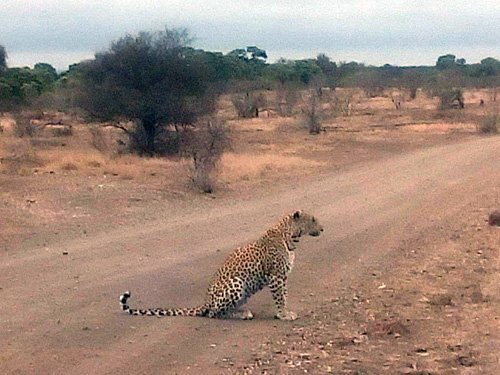 After the Lions within 2 km we found a male leopard crossing the road. On the 18 on a bush walk we found a bull elephant next to the river – we approached him and he was very relaxed. When we coming back to get vehicle we found a black rhino cow with her son next to the vehicle busy browsing. We managed to get to the vehicle while she stopped and looked at us not attempting even to run or to charge us. On 22 on H7 we found 3 white rhino. At Nsemane dam we found a pride of Lions eating a waterbuck. On S100 we found 5 lionesses and 2 male trying to catch a zebra and they failed because elephant chased them then the zebra saw them and ran off. 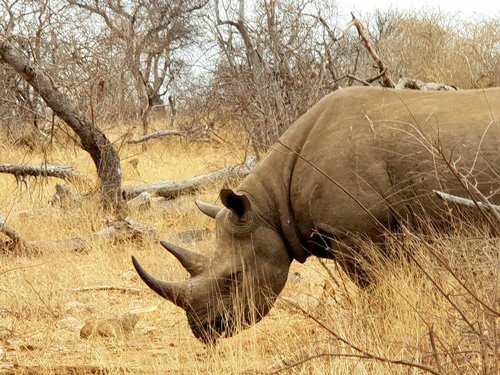 We have had some close encounters with Black Rhino – there is a Black rhino cow with calf and a bull black rhino (Zulu) that have been around at the spot we park our vehicles. We have had to be very patient on occasions as these animals can be dangerous. Of course the guests have enjoyed the adrenalin rush and have been happy to return to a later than usual brunch at Tremisana. We also regularly see hippos and crocodiles in the Olifants River. There is a large herd of Waterbuck that we see along the river. 6 Bull elephants have been seen regularly at Tremisana Lodge and 1 Bull white rhino and a small herd of buffalo at Marula Boma. Hyena have been seen every time I have visited Marula Boma. We had a pride of lions on Sable Road on a giraffe kill. 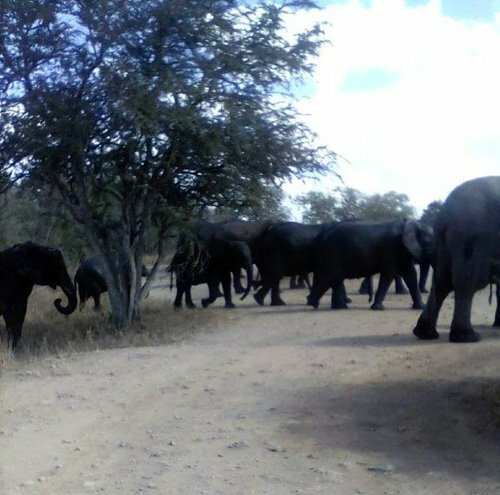 A herd of elephants has been around Barnard airstrip. Giraffe, kudu and impala are seen every time. We started our game drive and at the first boom gate we saw elephants next to the road. After a coffee bar stop ( once upon a time I used to work here ) we took the H7 to Satara. There was plenty general game including great sightings of giraffes, kudus and zebras. Near Nsemane dam we saw a leopard crossing the road. Then we went to S100 where we saw a lioness also crossing the road in front of our vehicle. Leopard on road at Nsemane Dam. After lunch we took the Sweni road S126 to Ximangwaneni dam. Here buffalos and elephants are always seen drinking water. On our way out we saw a hyena running down to Nwamatsantsa bridge and two white rhinos near Orpen. So it was a very productive game drive – our guests were very happy – five out of five in one day ! This month has a busy and exciting time in Kruger national park. We have had the privilege of following cheetah coalitions and mothers with cubs. With only 200 or so of these incredibly beautiful animals in the park, the guests and the guides alike have loved following these dynamic groups of our local speed demons. Despite still waiting for a good dousing of rain, it seems spring has spring, at least for the elephant populations. It makes for exciting drives with all the protective new mothers and their curious new-borns. Elephant herd at Ximangwaneni Dam. We are always excited to encounter young ellies strutting their stuff, challenging anything and everything to try to prove their toughness. Very comical displays ! Life is good in the bush, as always! 3rd : Hot and windy, sightings good. Leopard before Orpen reception, buffaloes also before reception, elephants drinking at waterhole in front of the shop, three white rhinos sleeping. So 4 of the 5 within the first 30 minutes. Lions later on S 100. 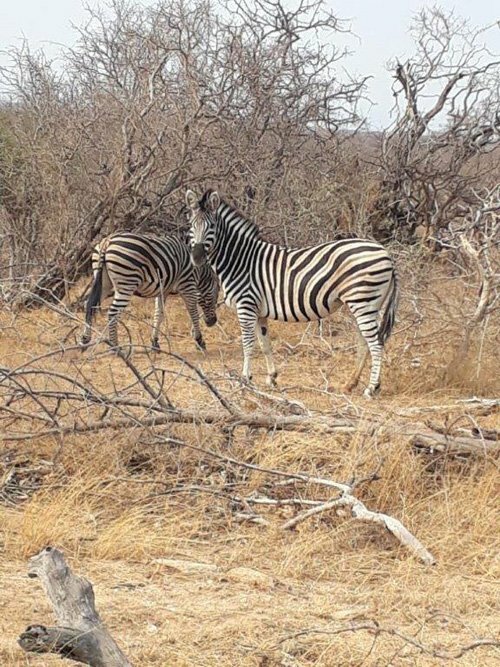 7th : Sightings good : lions phelwane bridge, white rhino s100 drinking, elephants s100 and sweni road, muzandzeni dam lots elephants and buffalos, a beautiful secretary birds at sweni windmill drinking, cheetahs before Rockvale windmill. Patrick having a break at Mudzanzeni Picnic Spot. 12th: Elephants and buffalos drinking at Orpen waterhole. 3 white rhinos, lions s100 xibotwana windmill lying down, plenty general game s100, 2 leopards s125 feeding on impala kill, buffalos ximangwanini dam, elephants, giraffes, zebra and other general game also there. 19th: 6 lions s100 xibotwana windmill lying down, leopard new road s147 near ngotso with a baby, elephants Ngotso, whites rhino, lion and elephants on s127 road, cheetahs on s40 before Girivana. 28th : Lions h7 timbavati riverbed, buffalos s36 between mzandzeni and ximangwanini crossing the road, plenty general game s100 and lions xibotwana windmill, elephants girivana windmill drinking, Lions on h7 trying to hunt impalas and zebras but failed to kill, elephants Orpen shop drinking. Katekani has been busy and we are pleased that our new chef, Tiger, has fitted in so easily. I am not sure if his name lends itself to culinary excellence, but I suppose it may indicate a passion – hopefully for cooking. The baboons, as mentioned earlier, have been so hungry that they have broken into the Boma twice. Besides finishing off all food, they successfully broke a lot of crockery and ornaments. One was skillful enough to prise open a small lock – nor sure how that happened. They possess strong canines but I have never heard of biting open a lock, even a small one ! We live and learn ! We have had good animal sightings around the camp. 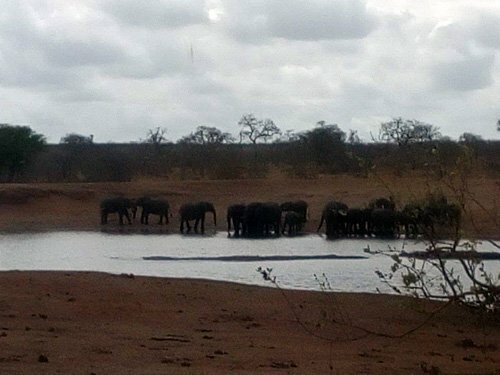 Animals are moving great distances to drink at our waterhole in front of the Lapa and at Tremisana Dam. They do not spend much time and move off quickly after quenching their thirst. The nyala are very plentiful and are extremely tame. 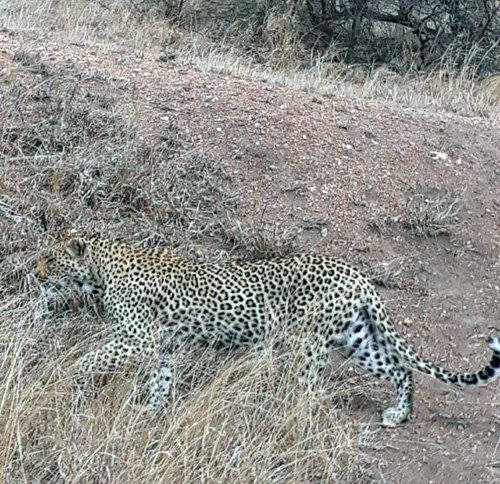 We are seeing a lot more leopards on the game drives at Motlala. We have a night time armed guard, Renek, who patrols the whole of our camp area. He informs that one particular male leopard is seen by him every other night. I have arranged for higher wattage lamps to be placed near the tented areas. Renek says that the leopard is not aggressive and is after the nyala, not our tourists. I have instructed him to spend more time around the communal ablutions area – no good having a tourist on the way to the loo being frightened. 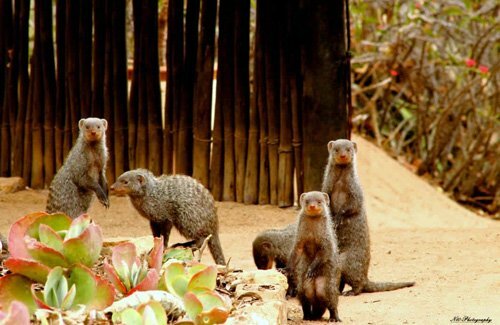 Banded Mongooses at Reception area of Marc’s. We do apologise for sometimes not being able to accommodate your guests. I am often asked why we do not build more accommodation at Tremisana. The reason for this is that we have an agreement in place with OWNR (Olifants West Nature Reserve) that we will not increase the number of our guest chalets. What we are doing is using other lodges in OWNR. Our luxury safari packages use Ezulwini and all other spill over goes to Nambu. I know these lodges (and their owners) well and give my personal guarantee that they are both top class establishments. We will most likely still have spare accommodation at our Masango Lodge and I am thinking of introducing a very low cost 3 day safari with both nights spent at Masango. Day 1 : Transfer from JNB to Hoedspruit from where our vehicle will transfer guests to Masango in time for a Sunset Drive on Motlala Game Reserve. Day 2 : Full day in Kruger Park on open vehicle. Day 3 : Morning walk with armed ranger along Klaserie River and return via Blyde Canyon to JNB. This will probably be priced at R 6695 per person. Masango Lodge comprises 8 en suite brick and mortar chalets, each with a max of 3 beds. As with ALL our products, there are no hidden costs such as payments for conservation fees, optional game drives or payments for shuttle transfers that some competitors conveniently omit in their pricing. Please give me your feedback. An experience I will never forget! I highly recommend Viva Safaris. They surpassed my expectations in every way. I met some great people, both guests and staff. They offer the whole package with a fantastic variety of accommodation and range of safari packages to choose from. When I went on my trip with Viva Safaris, I was fortunate to see the Big 5 and so much more. The rangers were very professional, knowledgeable and super fun to go on drives with. They use open sided vehicles that allows you to really be a part of the African Bush and get the best viewings of the animals as possible. When I return to South Africa and go on Safari, I will certainly use Viva Safaris again, as it’s an experience I would happily do over and over and know that they have so much to offer. My daughter and I were 6 days with Viva – first night in the bush Lodge (I suggest top sheets on the beds, not just comforter.) which was funky and very authentic. Really cool dinner by candlelight in the bush. SO MANY STARS! Next 4 nights in the Katekani tents- which were SO FABULOUS – comfortable, elegant, sooo clean. Loved my splash pool. The staff were all gracious and kind. The bush rides exceeded my expectations (so many animals!). The bush walk leaders were very knowledgeable. The food was at Katekani was EXCELLENT (one suggestion – more of a wine selection with dinner). Not an inexpensive trip, but very good value for what you get. (you get a lot). I highly recommend. The September weather was perfect, tent #2 hosted us just fine (not 1 spider on sight! ), the guides really know the bush, and where to find the animals. The sunset game drive finishing in a dinner under the Marula tree couldn’t be any more perfect. 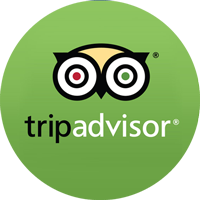 Their staff is a great asset, every member is very friendly and informed. Special mention to Ivy, Thabo, Lucky, Victor (his resting face includes a smile. the educational bush walk with him and the stories about his grandmother were just priceless); and Charl (so knowledgeable and passionate for the bush, it’s inspiring). Would not go back and do any other safari but this one. Highly recommend it ! This is great place with great people. I had the honour to have dinner with their GM- Piero. He is very caring and friendly, he drove me to different places and visit the treehouses also. The room is Wow me when I entered it. It’s like the 4 stars standard at least. We arrived at Tremisana after our long journey to a warm welcome by the friendly staff. We had a comfortable and nicely decorated room with fresh linen. 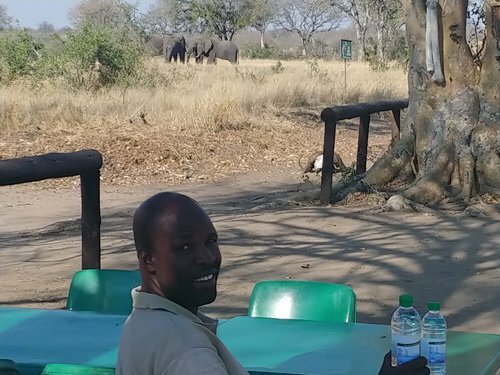 We enjoyed the game drives with knowledgeable rangers who educated us so much about the wild life and nature. The highlight of our trip was seeing a pride of 25 lions, lioness and cubs at close range around our vehicle. This was undoubtedly our most amazing experience. A braai in the Boma under the moonlit sky and bright stars was incredible. Meeting at the Lapa for our delicious home cooked African cuisine and interacting with tourist from all parts of the world was most interesting. We sat out there and watched the animals come to the watering hole and was amazed to see a lion walked by. We were overwhelmed with such sighting. A 3-hour bush walk was a unique experience. Our trip was most memorable and strongly recommend to all safari enthusiasts.